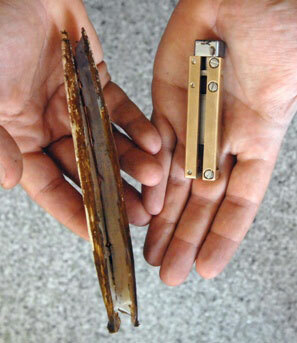 (Nanowerk News) The Atlantic razor clam uses very little energy to burrow into undersea soil at high speed. Now a detailed insight into how the animal digs has led to the development of a robotic clam that can perform the same trick. The device, known as "RoboClam," could be used to dig itself into the ground to bury anchors or destroy underwater mines, according to its developer, Amos Winter, the Robert N. Noyce Career Development Assistant Professor of Mechanical Engineering at MIT. RoboClam, the metal device on the right, next to the inspirational razor clam to the left. Despite its rigid shell, the Atlantic razor clam (Ensis directus) can move through soil at a speed of 1 centimeter per second. What's more, the animal is able to dig up to 0.5 kilometers using only the amount of energy contained in a AA battery. "The clam's trick is to move its shells in such a way as to liquefy the soil around its body, reducing the drag acting upon it," Winter says. "This means it requires much less force to pull its shell into the soil than it would when moving through static soil." To develop a robot that can perform the same trick, Winter and his co-developer, Anette Hosoi, professor of mechanical engineering and applied mathematics at MIT, needed to understand how the clam's movement causes the soil to liquefy, or turn into quicksand, around its shell. Now, in a paper to be published in the journal Bioinspiration and Biomimetics, the researchers reveal for the first time the mechanics behind this process, and describe how their robot is able to mimic this action. But the timing is crucial. If the clam were to move its shell too slowly, the sand particles would collapse around the animal without fluidizing, Winter says. However, if the clam moved too quickly, it would not give the sand particles enough time to mix with the water flowing past, and they would simply remain stationary. "Our data showed that there was a very abrupt transition from being able to fluidize the soil to not moving the soil particles at all," he says. To make it easier to test their RoboClam prototype in salt water, the researchers used a compressed air system to power the expansion and contraction of the shells. Winter's team is now developing an electronic version, which will make it compatible for use with underwater vehicles developed by the team's sponsor, Bluefin Robotics, an MIT spinout based in Quincy, Mass. Winter first began developing the RoboClam for his PhD research in 2006, alongside Hosoi. The researchers wanted to find a way to anchor autonomous underwater vehicles to a seabed or riverbed without consuming a great deal of energy. Robotic vehicles have limited battery power, so any energy consumed by the anchoring system would reduce the device's operating time. "You might be operating these vehicles in a current, and need them to be stationary — for example, to monitor a biological situation, or for military purposes," Winter says. "You wouldn't want the vehicle constantly spinning its propellers in order to stay in one place because that just wastes energy, so it would be nice if you could just deploy an anchor and maintain your position without expending any energy." In addition to anchoring underwater vehicles and detonating mines, the RoboClam could also be used to lay underwater cables, Winter says. Companies that lay trans-Atlantic cables traditionally use a ship to drag a sled along the bottom of the ocean to dig a trough, lay the cable, and cover it over. However, when the depth of the ocean water drops to 10 meters or less, it becomes too shallow for the ships to move through. This means human divers have to take over laying and burying the cables, which is both time-consuming and expensive. "Having a system that could just latch onto the cable, work its way along, and automatically dig it into the soil would be great," Winter says.